The boards are suitable for home, office, study, lecture room or the board rooms. The color of felt cloth or the neutral tones of 100% cork will blend with any decor. Framed in double sided curved Astra aluminum section. Direct easy fixing of board to the wall. Corner covers conceal the screw to fix on the wall. Accepts push pins, map tracks etc. Push pins are also available. Colors of felt: Green, Red, Blue, Gray, Maroon and Beige. 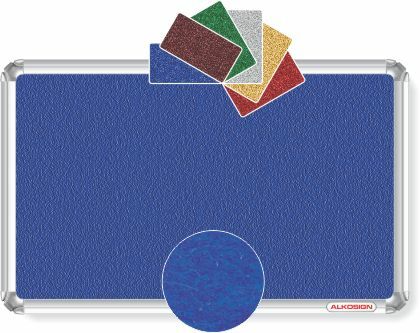 Special fabric enhances the decor of the office or any establishment. Colours of Fabrics : Grey, Beige, Blue, Brown. Similar to Felt Notice Boards. 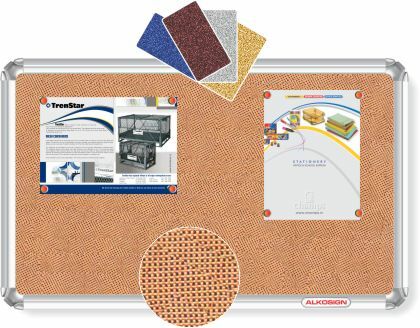 Up to 900mm x 1200mm single cork sheet. Bigger size boards with joint cork sheet also available. Used on felt or cork notice boards. Six colours : Green, Red, Blue, Yellow, White & black. 12 Push pins in one plastic container. 6 containers in one printed box.